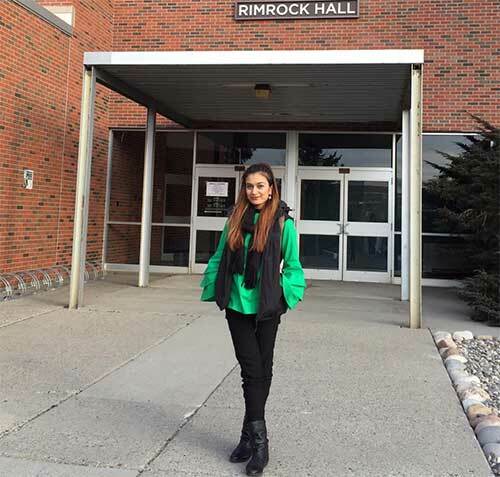 MSU BILLINGS NEWS—Montana State University Billings is pleased to welcome a new international student, Manal, to campus as part of the U.S. Department of State’s Global Undergraduate Exchange Program in Pakistan (Global UGRAD-Pakistan). Manal has joined the Yellowjacket family for the spring 2019 semester and will be studying marketing. She will study at MSU Billings for one semester before returning to her hometown, the City of Lahore, within the Province of Punjab in Pakistan. The Global UGRAD-Pakistan program, which places participants at U.S. colleges and universities for academic study, is part of a broader U.S. Department of State effort to promote better understanding of the United States abroad, particularly among future world leaders. This is the third semester that MSU Billings has been selected to host a UGRAD-Pakistan student. The Global UGRAD-Pakistan program allows students to excel academically as well as be involved in their host community. During Manal’s travels, she will be volunteering at MSUB’s TRIO Student Support Services with Laura Gittings-Carlson. Since the program’s inception in 2010, Global UGRAD-Pakistan has provided more than 1,600 talented, highly-motivated undergraduate students from underserved populations across Pakistan with the opportunity to study at a U.S. college or university. Through semester-long academic study, exploration of U.S. culture, participation in community service projects, and interactions with Americans in their host communities and campuses, Global UGRAD-Pakistan participants develop expertise in their academic fields, gain a broad and nuanced understanding of American culture and values, and go on to share this understanding with their communities when they return home. Over the past eight years, participants have volunteered over 34,000 hours with community organizations across the United States. In addition to volunteering at TRIO, Manal will be involved in a variety of activities beyond her coursework, including contributing a minimum of 20 hours of volunteer work around the community and making presentations about her home country in schools, retirement homes, and Rotary clubs. Global UGRAD-Pakistan participants enrich the lives of the Americans they meet by sharing their unique viewpoints and backgrounds and bringing a global perspective to their host communities. These ties endure, with over 95 percent of program alumni maintaining relationships with Americans they met while in the United States. Learn more about the UGRAD program by visiting https://www.irex.org/ugrad-pakistan. For more information, contact Neil Beyer at 657-1762 or neil.beyer@msubillings.edu.